For well-developed ovaries or good embryo production, start with equal numbers of 2- to 7-d-old male and female flies kept together in uncrowded conditions, transferring them to new food vials supplemented with wet yeast paste once or twice daily for two or more days before collecting samples. 1. Anesthetize flies under CO2 or on ice. 2. Dissect females in depression plates or slides in a drop of DR. Grasp fly between thorax and abdomen with forceps and pull at the terminal part of the abdomen with another pair of forceps to release the ovaries and other organs from the cavity. 3. Tease ovaries away from debris and separate ovarioles from each other with tungsten needles. 4. Transfer tissue in DR to microcentrifuge tubes (see Notes 1 and 2). Hold tissues on ice until all samples have been collected. 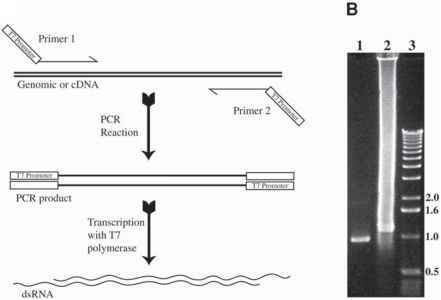 Proceed to Subheading 3.2. for TUNEL, Subheading 3.3. for AO staining, or Subheading 3.4. for Annexin V staining. 1. Apply a dab of fresh yeast paste to an apple juice/agar plate. Attach the apple juice/agar plate to the mouth of the egg-laying chamber. Transfer flies to the chamber and allow flies to lay eggs for the desired time (see Note 3). 2. Use water and a fine brush to dislodge the embryos from the surface of the plate and collect them with a large (1000-|L) pipet tip (see Note 2). Alternatively, pour embryos into the baskets with a gentle stream of water. 3. Transfer the embryos to baskets and remove the water. Dechorionate embryos in baskets using 50% bleach for 2-5 min and wash several times with water. Proceed to Subheading 3.2.2. for TUNEL or Subheading 3.3. for AO staining. 1. Select larvae from the food or the side of the vial using forceps. Fig. 1. 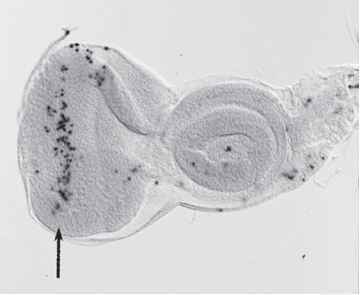 Eye-antennal imaginal disc from a third instar larva labeled with the TUNEL method. Significant labeling is seen in the posterior region of the eye disc (arrow). glands, and imaginal discs will remain attached to the head and will pull apart from the rest of the larval body. 3. Peel away the remaining cuticle and mouth hooks and remove desired imaginal discs (see Note 4). 4. Transfer tissue in DR to microcentrifuge tubes (see Notes 1 and 2). Hold tissues on ice until all samples have been collected. Proceed to Subheading 3.2.3. for TUNEL staining. See ref. 34 for AO staining of imaginal discs.